How many times have you been in a restaurant, historic building, or just anywhere and wondered what type of wood is being used throughout the building? Maybe you just have too much wood in your shop, and can't remember what is what. Some types of wood are incredibly easy to ID, while other species are not. The I.D. 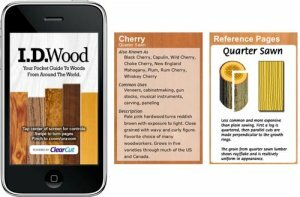 Wood App for the iPhone or iPod Touch is a reference guide that is designed to make identifying wood as easy as possible. With over 50 species of wood listed, including high quality sample photos and species descriptions, identification should be a breeze. I.D. Wood also lists interesting facts about the species, such as common uses and other names.